This Texas-style dry rub recipe is a great way to spice up beef brisket. Remember, when applying to the brisket, work the rub thoroughly into the meat to get the flavor inside. In true Tex-Mex style, this rub has a kick to it from cayenne pepper and hot chili powder. The heat can be adjusted to your liking, but leave some in otherwise this won't be a Southwestern-style meat rub. In a medium bowl, whisk together paprika, salt, garlic powder, onion powder, black pepper, dried parsley, cayenne pepper, cumin, coriander, oregano, and hot chili powder until thoroughly mixed. The rub is now ready to be applied to a brisket or any other protein of your choosing. Sprinkle it on liberally and rub it in thoroughly on all sides. Never place the entire batch of rub in a bowl and then place the protein in it because you will contaminate any rub leftovers rendering them unusable. Cook the protein as the brisket recipe directs. This rub can be made ahead of time. Store any leftover rub (this is the reason for sprinkling it on) in an airtight container in a cool, dark place for several months. Don't store it in the refrigerator as this will cause condensation and will affect the flavor and consistency. This recipe makes enough for up to 5 pounds of meat, probably more than you will cook for one meal, so any rub leftovers can be stored for later use. Don't let the "brisket" adjective steer you wrong; feel free to use this rub on other types of meat like pork, lamb, and venison, or poultry and seafood. When using a rub on poultry, make sure to get it both under the skin and on top of the skin. Adding sugar will cut the heat a bit, so you can do so if that is what you prefer. Other variations include adding dry mustard or chipotle pepper to the rub. 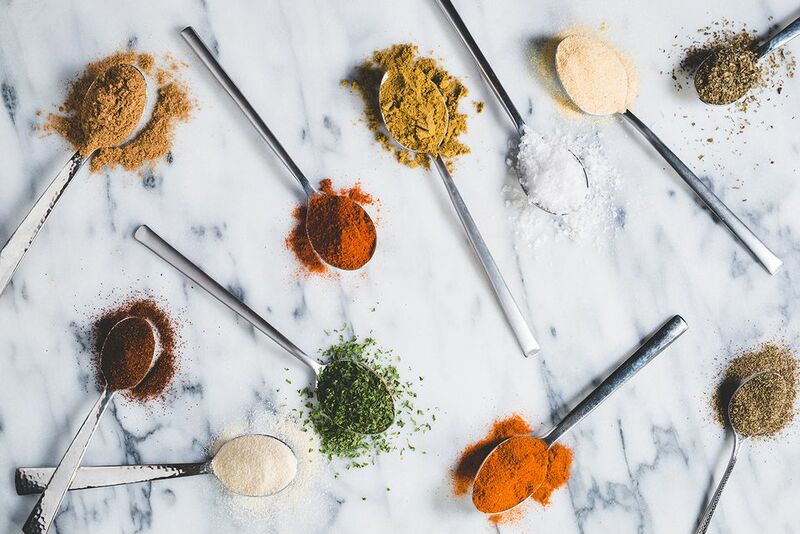 Feel free to experiment with which spices to find the combination that suits you best. Both dry rubs and web rubs accomplish the same purpose; they enhance the flavor and can serve to tenderize the meat. As to which is better, the jury is still is out. It really boils down to which you prefer. If you're unsure, try experimenting a bit. Dry Rubs: A dry rub mixture starts out with the basics—sugar, and salt. Then, it's pretty much up to you as to which dried spices and herbs you use. The sugar can be white, brown, turbinado, or any other kind and the spices can be whatever pleases you most. The dry rub is then thoroughly rubbed into the protein you're working with, which is then typically grilled, roasted, or cooked using a combination of the two techniques. Wet Rubs: A wet rub, as the name implies, contains sugar in a liquid form like molasses or honey, salt, spices, dried or fresh herbs, and oil. The consistency is a thick paste and the advantages are that it stays on the meat better and the oil can help prevent meat from drying out and sticking to the grill. Barbecued brisket can be cut and served as slices with sides such as baked beans, coleslaw, or potato salad. You can also enjoy slices of brisket on a bun with the barbecue sauce of your choice—as long as it isn't a Carolina-style vinegar sauce (Texans would object). If you prefer, you can make a grilled barbecue sandwich in a skillet or using a panini press.